Air Draft: the distance from the top of an ocean vessel's highest point to its waterline. Last year at this time, a grain elevator just south of Hillsboro, North Dakota, had filled three trainloads of soybeans headed to the Pacific Northwest in a single week to meet orders from China. This year it's a different story, due to Beijing's 25 percent retaliatory tariffs on American soybeans that went into effect July 6. UP said that this plan will first be implemented on its North/South corridor, creating more streamlined operations from Wisconsin to Texas. "Further roll out will occur in phases with initial implementation across the entire rail network expected by 2020. We will closely monitor the impact of these changes to align our strategy with our overall goals to improve network performance and provide the reliable service you have come to expect," added UP. Santos, South America's biggest container shipping port, should have Brasilia's management authority taken away and given to Santos City Hall or the São Paulo state government - something that would slash costs and reduce bureaucracy, so said Luiz Otavio Campos, national secretary of Brazilian Ports, speaking at the recent Santos Export Conference in the port city. United States Class I railroad carriers BNSF and CSX this week announced they will collaborate on a direct-rail domestic and international container-only intermodal service running between Los Angeles and North Baltimore, Ohio, which is slated to kick off on October 29. 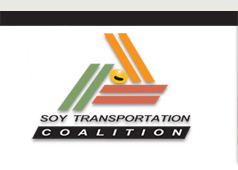 The Soy Transportation Coalition is comprised of thirteen state soybean boards, the American Soybean Association, and the United Soybean Board. The National Grain and Feed Association and the National Oilseed Processors Association serve as ex-officio members of the organization. Click HERE to edit your Subscription Preferences.